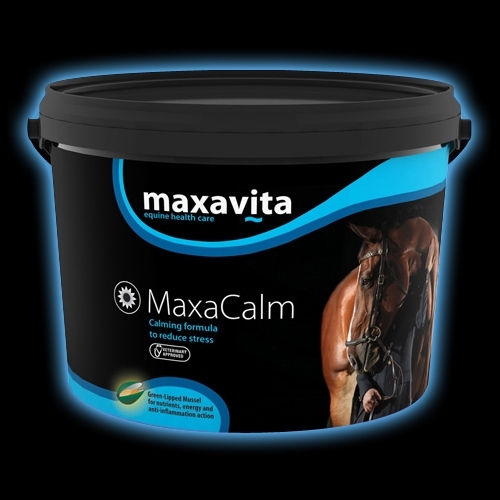 MaxaCalm is an equine calmer with a bit of a difference. A magnesium based blend containing Green Lipped Mussel for horses, L-Tryptophan and soothing herbs, MaxaCalm helps take the edge off sharp and nervous horses without losing sparkle. Though better known for its uses in joint care, Green Lipped Mussel is a potent source of Omega 3 fatty acids which are known to aid concentration levels and improve brain health. A fast acting calmer, designed to help you see results in as little as 7-10 days, MaxaCalm works to help your horse relax and focus on the task in hand. With no listed banned substances, MaxaCalm is suitable for horses competing at all levels. 1 level scoop (30g) daily added to feed. Magnesium plays an important part in nerve and muscle function. Horses deficient in this important element can show signs of nervousness, wariness, excitability, and muscle tremors. This gives magnesium its reputation for having a calming influence on equines. is an essential amino acid which is made from plant or animal sources. This amino acid helps to raise levels of serotonin which is linked to relaxation, reducing stress levels and anxiety among other problems. Horses are unable to produce L-tryptophan and therefore is a common ingredient in many calmer supplements. Green Lipped Mussel is a potent source of Omega 3 fatty acids including DHA and EPA which are known to aid concentration levels and to help support brain health. Withania or “Ashawagandha” strengthens and calms the nervous system. Ashwagandha is a wonderfully balancing herb that helps the body and mind to adapt to the stresses of everyday life. Passiflora or “Passion Flower” is a fresh herb tincture for stress which is believed to improve blood supply to the heart. includes calming of the digestive tract, and easing of the spasms of irritable bowel syndrome. It is a relaxant and mild natural sedative, so it is often taken against anxiety.n K.
Lemon Balm is also used medicinally as a herbal tea, or in extract form, along with aromatherapy with humans. It is used as a mild natural sedative or calming agent. Ingredients per 900g/30 day supply. Per day 1 x 30g scoop. My horse( 17hh danish warmblood) was a little too hyped up for my liking a while ago. He was on soaked hay and handful of chaff and handful of mix for a night feed. Mum was riding him in the morning then I was schooling him in the evenings on an airfield ( as I had no access to a school). Several times he blew up with me on the airfield, rearing and bucking and I was terrified of losing him in a big open space so close to a main road. Mum and I made a rushed trip to Wadswick one morning to see what was on offer….NEW PRODUCT STOOD OUT!!! It was amazingly priced compared to the others. We bought MaxaCalm. Mum and I were impatient at first and wondered if it was going to work, but after a week he was a lot more chilled not just out riding and schooling but even in the stable! He wasnt stable walking and stood nicely whilst we tacked up. He is like a different horse completely and I love it…he is jumping 1.15m courses BSJA now with no problem and no fuss! Thank you Maxavita…. I will be trying out the different products in the range without a doubt. My Novice/Intermediate horse Zoppah Karla is fed MaxaCalm. He is a very uptight, tense horse and struggles to concentrate when doing flat work. The calm really works for him and at Aston I double dosed him the night before with the powder mixed into a paste and seringed into him, he kept his cool all day doing his best ever test of a 29!! I just wanted to say how pleased I am with you product MaxaCalm. I have used many different calmers for my ex racehorse mare with varying results. She had a foal two weeks ago and their turnout field is next to a busy yard with menage and bordered by a railway line and a trotting yard. I really wanted her to not be anxious and settle to her grazing. It has worked a treat. She is not a spooky mare but can get anxious and it is testament to your product that she can be so calm in such a “buzzy” atmosphere with foal at foot. So much so that I am just about to enter them for a show- I was concerned she would be too hyped up to manage but I think we will certainly be having a go. Many thanks once again. I just wanted to say how wonderful MaxaCalm has worked for my daughters pony. He is a feisty, excitable character, which sometimes made life for my daughter hard, when competing at large events. MaxaCalm seems to have taken the edge off him without losing his mischievous personality and is helping her to be more confident and in control when schooling and competing. He also seems to be fooled into eating with all the different flavoured herbs! MaxaCalm has made a huge difference to a highly strung and sensitive mare on my yard, since I have started using the produce she has become rideable, settled and a really talented prospect for the up and coming season.